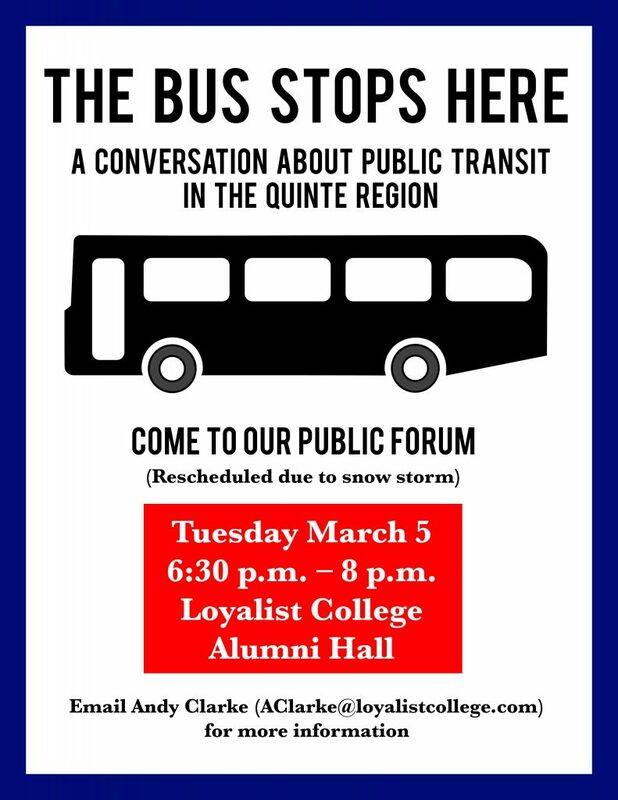 BELLEVILLE – Loyalist College’s Journalism-Communications program is hosting a public forum Tuesday night to talk about the possibility of a regional public-transit system in the Quinte area. This conversation started late last years when Sarah Law, a student in the final year of journalism at Loyalist, started working on a story about housing in Belleville and how it’s hard to find rental accommodation, said Andy Clarke, a journalism-communications professor. After that, Law and Clarke put together a team of journalism students to work on stories about the possibility of a regional transit system. The headlines for these stories include: Is a regional transit system possible in the Belleville/Quinte West area?, Regional transit: co-operation among municipalities is the key, advocates say, Transportation a key issue for Quinte-area seniors, especially in winter, Students share their transit struggles, Is a semester-long bus pass for Loyalist College students a good idea?, Public transit essential for Quinte seniors’ well-being, advocates say and Walking in a winter wonderland – on the side of Highway 62. Politicians, representatives of community organizations and public servants connected to public transit are expected at Tuesday’s forum. Clarke said he wants to get the word about the event out to ordinary citizens so they can come and share their stories about public transit and how a regional transit system could help them. The forum isn’t just a place to complain about what’s wrong with the current transit options, he said. The forum will be held in Loyalist College’s Alumni Hall from 6:30 to 8 p.m. Tuesday. Everyone is welcome to attend and be a part of the conversation.